Deru Kugi Wa Utareru is a Japanese proverb which can be translated as "The nail that sticks up the farthest takes the most pounding." When I came across this saying, it helped to explain how 120,313 people of Japanese ancestry, 2/3 of whom were American citizens, could so obediently submit to being incarcerated during WWII. The proverb and its translation wrap around the room. The walls are wallpapered with copies of letters from my maternal grandfather and documents of testimony by former internees given before congress. Stippled into the walls is a grid of 120.313 holes, one for each person interned. 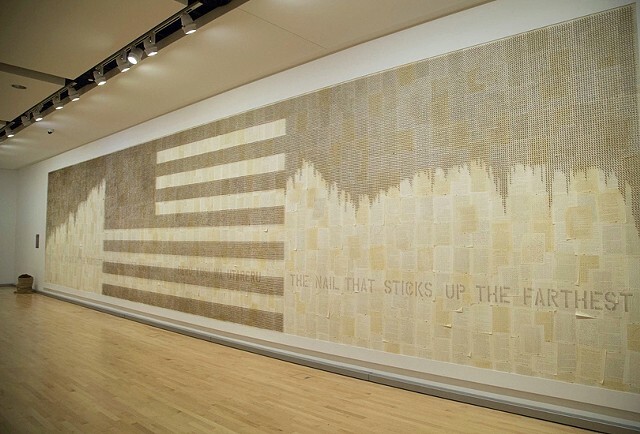 Rusted nails are pounded into the grid, forming a large American flag on the main wall. The remaining nails would fill the walls. Visitors are encouraged to add nails to the wall in memory of or to honor those who were incarcerated.